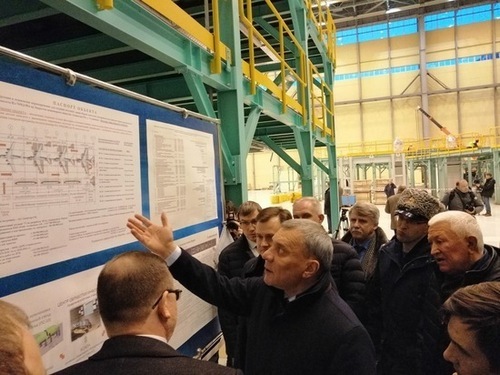 A few days ago, a number of media outlets reported that the chair was reeling under the head of the military transport division of the United Aircraft Building Corporation (UAC) Alexei Rogozin, the son of the head of Roscosmos Dmitry Rogozin. Sources hinted at problems in the industry. Nobody has officially confirmed the information, and therefore the idle “experts” remained to read the tea leaves. And now Deputy Prime Minister Yury Borisov, who oversees the defense industry, clarified. During a working trip to the Ulyanovsk aircraft factory, where the modernized Il-76MD-90A military transport planes are assembled, he confirmed: there are problems in fulfilling the defense order for these planes. He also told reporters, including the correspondent of MK, how it is planned to solve them. According to the Deputy Prime Minister of the Russian Federation, Yuri Borisov, who, before being appointed to this post, served as deputy minister of defense, certain problems arose in the UAC military transport aviation division. They are associated with the organization of deliveries to the main customer, the Ministry of Defense, of the sought-after Il-76MD-90A aircraft. Sometimes they are called IL-476 to emphasize the “advanced” new cars, in comparison with the IL-76. IL-76 aircraft were built in the USSR at the Tashkent aircraft factory. The average age of the machines remaining in the VKS is 30-40 years. Engines are wasteful in terms of fuel efficiency. Airborne equipment – antediluvian. A military aircraft aircraft is needed. Therefore, it was decided to resume the production of these aircraft after a long break, but at a different technological level – with other engines, an electronic cabin, a new navigation system. Made and transferred VKS first three cars. – According to the past years, the state defense order was disrupted and the vehicles that were supposed to go out are coming 3-4 months late. A meeting in Moscow was devoted to this a day ago. They dealt with the causes, the technical state of affairs, with all the cooperation. And today I found it necessary, together with the customer, to visit the Ulyanovsk Plant, as the main plant that manufactures these machines in series. According to him, the task is to look at and evaluate the readiness of production, the capabilities of the plant are technical, personnel. – Because in the plans of the Ministry of Defense, this machine is the main one. Potentially, until 2030, the Ministry of Defense intends to purchase more than 100 aircraft. And if we add to this another tanker aircraft at their base, this number increases. So, the military plans – to increase the fleet of military transport aircraft for ten years by 100 IL-476 aircraft. The example of the transfer of troops by the Soviet Union with the start of operations in Afghanistan on December 25, 1979 speaks about the scale of the tasks that such a fleet will allow to solve. For the transfer of paratroopers and equipment from the 103rd Airborne Division and a separate paratrooper regiment to Kabul and Bagram, 55 military transport aircraft were involved. In less than two days, 343 sorties were flown. An-22 aircraft (66 flights), Il-76 (77), An-12 (200) were used. They transported 7,700 men and nearly 900 combat vehicles. In total, during the war years, the aircraft delivered almost 50,000 tons of military cargo to Afghanistan. So it is no coincidence that the plans of the Ministry of Defense and the aviation industry of military transport aviation paid no less attention than strategic aviation. Without military transport aviation it is impossible to transport troops over long distances or conduct large military operations. The Deputy Prime Minister outlined the tasks facing the Ulyanovsk Plant: this year to release at least six aircraft, next year to reach the production volume of at least seven aircraft. Starting from 2021, have production capabilities guaranteed to produce 10-12 aircraft per year. Is it a lot or a little? Everything is relative. For example, a huge aircraft factory built in Ulyanovsk during the Soviet era in the image of the Boeing corporation was supposed to produce 50-60 aircraft planes of the An-124 Ruslan giants in the year. The plant almost died along with the USSR, never reaching its design capacity. He released a total of 36 Ruslans. Now here’s the production of the Soviet aviation industry. But Boeing produces 40-50 aircraft per month. Sense to rest and increase the release of the same IL-476 is. This successful aircraft of the Ilyushin Design Bureau is in great demand in the world. Algeria, Kazakhstan is among potential buyers. But with small-scale production, the demand is not satisfied. Plans to expand production capacity. A new workshop for the so-called bezstapelnoy automated assembly is almost ready. It will allow you to build more dynamically, reduce costs. According to Yuri Borisov, “the almost total capacity of the old building assembly and the new one will ensure all the needs of the Ministry of Defense and external customers.” Ulyanovsk aircraft factory promised full support. To fulfill the production plans, a new staff recruitment has been announced – more than a thousand people. Sergey Morozov, the governor of the Ulyanovsk region, who visited the aviation hub together with Yury Borisov, said that a large-scale program of social support for the aviation industry workers is already being implemented in the region. “We made decisions in Moscow on the whole range of issues that today are pursuing the division of military transport aviation,” said Yuri Borisov. – I can say that we made a decision to establish a permanent commission of the Ministry of Industry and Trade and the Ministry of Defense. The Deputy Prime Minister explained that this would use the experience gained in organizing work on the resumption of aircraft production at the Kazan aviavod, where they restored the airworthiness of the strategic Tu-160 missile carriers and established the production of the practically new Tu-160M2 aircraft. The experience was positive, it is advisable to apply it here. – In fact, on a monthly basis, the two deputy ministers will hold meetings, gather cooperation and monitor the progress of preparation for production and the completion of all research and development work in this area. This is a manual control, but there is no other way now, ”the Deputy Prime Minister concluded. He did not specify which organizational steps would be taken in “manual mode”. One thing is clear – the order for new transport aircraft for the army has been taken under the most stringent control.